Chef Boy goes oriental with Hainanese Chicken. The original recipe hails from the Hainan region of China but the dish is quite popular in Malaysio and Thailand. A heavy favorite of those favoring Southeast Asian Cuisine, This dish is quite tricky to do. For one, the chicken has to retain its natural juiceswhich can evaporate in a jiffy if overdone. And the symphony of flavors may not play out well if the chef's baton is off. Here, Chef Boy - again - does it just right. 1. Wash chicken and remove excess fat. Rub the inside of the cavity with salt. Smash garlic, ginger and scallions inside the chicken cavity. 2. Bring the water to a boil in a pot large enough to hold the chicken. Add the chicken, breast side down. Simmer, covered, 30-40 minutes, turning chicken halfway through the cooking process, until chicken tests done (juices from thigh should run clear when pricked with a fork). 3. Carefully remove chicken, draining liquid from body cavity back into the pot. 4. Reserve the stock to make chicken rice. Plunge the chicken into ice water for 5 minutes to stop the cooking process and tighten the skin. Drain, rub with sesame oil, and let cool to room temperature. 5. To serve, chop chicken into bite-size (the Chinese do this bone and all) and arrange on a platter. 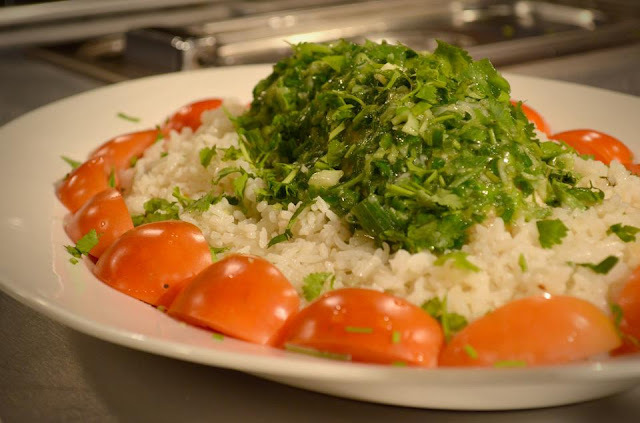 Garnish with sliced tomatoes, cucumbers and cilantro sprigs. 6. To make the chicken rice and drain into colander. Let stand ½ hour to dry. 7. Heat oil in a wok. Add the shallots and garlic. Stir-fry until fragrant. Add rice grains and stir-fry 3-4 minutes, until glossy and fragrant. 8. Transfer to a sauce pan. Add the chicken broth and salt. Bring to a boil over high heat and boil until the liquid level evaporates to the level of the rice and steam holes appear. 9. Turn heat to low. Cover and simmer 40 minutes. Serve with Hainanese chicken.Serve with Chili Sauce.